One up-and-coming animated documentary creator is Diana Cam Van Nguyen, a student at the Film and TV School of The Academy of Performing Arts in Prague. In her film debut The Little One (2017), she embodies her feelings as a Vietnamese girl growing up in a small Czech town. This short film has been screened at almost fifty international festivals around the world and has won a number of awards. It will be competing for the ECFA Doc Award – the best European documentary for children – at this year’s Berlinale festival. The author also chose the same format for her current film Apart. „The hybrid genre of animated documentary holds many advantages. I have realised that it is a suitable form for searching for one’s own past and for expressing a subjective view. It keeps a strong emotional dimension at the same time„, Diana Cam Van Nguyen’s explains concerning her decision. In her new film the director focuses on the theme of losing a loved one and reconstructing the painful situation through the eyes of three young people who are exposed to the phenomenon of death prematurely. 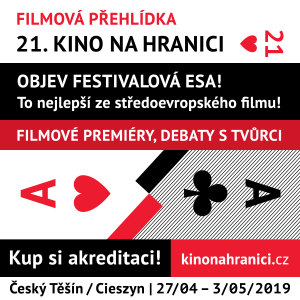 Apart has already won the award for Best Czech Experimental Documentary at the Ji.hlava International Documentary Film Festival and this year it has been selected for the prestigious International Film Festival in Rotterdam. The Anifilm International Festival of Animated Films has decided to dedicate its main focus to animated documentaries in 2019. The intention is to map the key moments of this genre on a global scale. A diverse selection of films, especially shorts, will be prepared in collaboration with German curator and long-time programmer of the Animadoc festival in Leipzig, Annegret Richter. As animated documentary is becoming increasingly popular in the Czech Republic, a part of the programme will also be devoted to the history of Czech animated documentary. Swedish director Jonas Odell is among the first confirmed guests. „We would like to acquaint the audience with the charm and power of animated documentaries through programmes by prominent world-class artists. In addition to their films, they will present their working methods during the masterclass segment in Třeboň. In addition to Jonas Odella, Anci Damian’s participation is becoming more certain,” says Pavel Horáček, the Programme Director of Anifilm.